Member of prof. Solomatin’s team from 1999. Specialist in refractive pathology. Performed more then 10 000 laser eye surgeries. 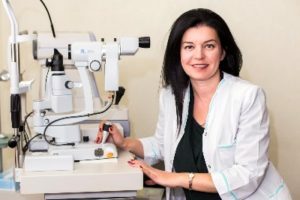 Prof. Solomatin and dr. Gertnere were first in Baltic countries to introduce laser eye surgery technologies in late ’90. Dr. Gertnere graduated from Riga medical university, continued education in Latvian university. Dr. Gertnere is a member of European and American societies of cataract and refractive surgery, regularly takes part in international congresses, practical workshops organized in world best clinics – Germany, USA, Chech republic, Austria, Belgium, Russia. Active in scientific work.